Yep, she already finished the binding! What type of ironing board set up do you have that you mom is using in the pic? It would be very interesting to sit next to your mom and bind my own quilt. We appear to have exactly opposite ways of stitching down bindings (despite both being right-handed)–I can’t even picture how she does it! Your mom is a machine! Awesome. Can I borrow her, binding really slows me down’ She is amazing. Now I know where you got your work ethic. She is amazing!! I could sure use her in my sewing room. How very special to have this time together! I hope the sewing therapy helped the cold symptoms! Can’t imagine how speedy your Mom would have been had she felt better! 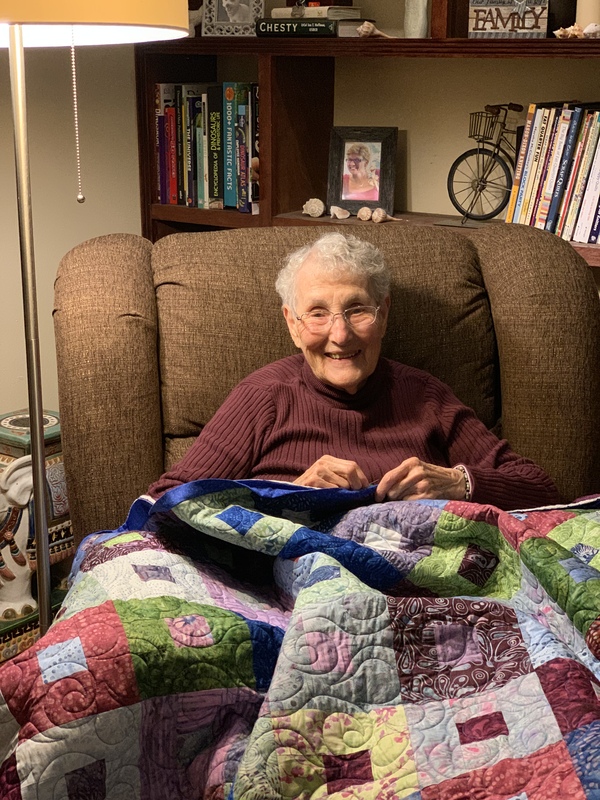 I absolutely love, love, love that quilt! I’m new here. Had a delightful visit! Can’t wait for more! Your Mom is a champ! : ) Brenda, Bend, Or.